Most new Chromebooks come with the Google Play Store out of the box, which allows you to quickly install your favorite Android apps. If your Chromebook was introduced in or after 2017, then it’s guaranteed to run Android apps. Either way, Google has put together an extensive list of Chromebooks that have access to Android apps that you can check. Google rolls out Android compatibility on a device by device basis, so it’s a good idea to find your specific model if possible. If you’re not on that list, there’s still a way to do it, just skip down to our second section. Step 1: First, make sure that your Chromebook is running the latest Chrome OS version. You’ll need Chrome OS version 53 or later. Step 2: To check, select the status area or the Settings cog. Then select About Chrome OS at the top of the screen. Step 3: In the About window, select the Check for and apply updates button. If there’s an available update, it will download and install. Once it’s finished, select the Restart to update button. Step 4: Once your Chromebook is updated, then go to the status area and select the Settings cog. Go to the Google Play Store section, and check Enable Google Play Store on your Chromebook. You will be prompted to agree to Google’s terms of service — select I Agree to continue. The Google Play Store app will open, and you’ll be asked to accept some additional terms and conditions. Once you’ve done this, you can proceed to the How to download… step below to install your chosen apps. In other words, make sure that all of your data is backed up before starting this process. If you’re not comfortable with running unproven software, then remember that the Chrome OS developer channel will maintain your Chromebook on the least proven version available. Once you’ve decided to take the risk, switching your Chromebook to the Chrome OS developer channel is a relatively simple process. Step 1: Just select on the status area in the lower-right corner and select the Settings cog. This will open the Chrome OS settings page. 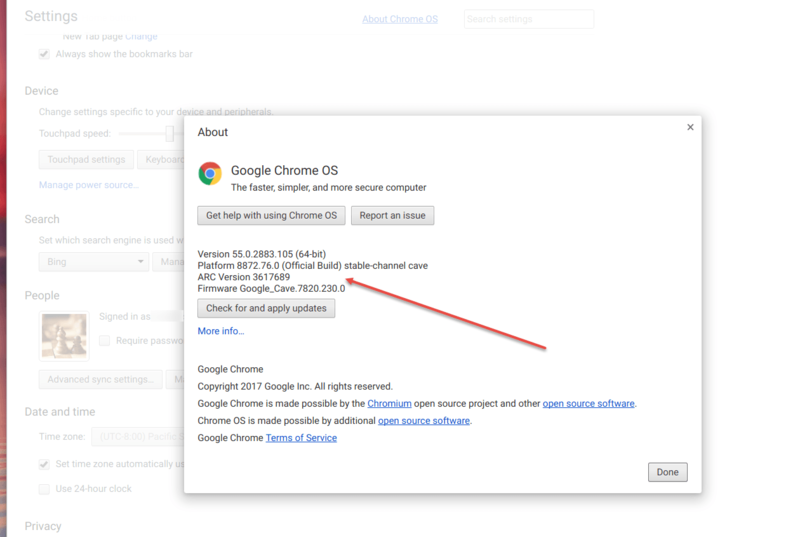 Step 2: Select About Chrome OS at the top of the page to check your version number and current channel. Step 3: Select More info… to expand the page and dig down into the details of your Chrome OS installation. 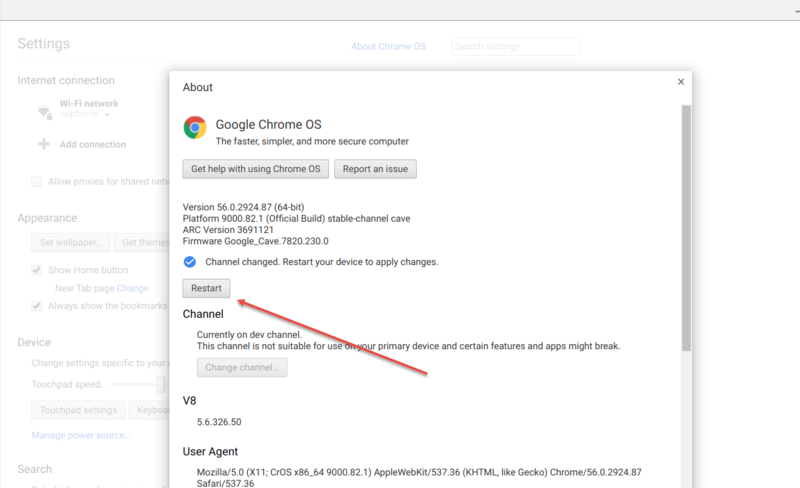 Click on the Change channel… button to open a dialog where you can select a new channel for your Chromebook. Step 4: You have two options, Beta and Developer – unstable. Select Developer – unstable and read the warning notice carefully. If you’re sure you want to proceed, select the Change Channel button. Step 5: Chrome OS will proceed to update your device and put it into the developer channel. Wait for it to finish, and then select the Restart button. Step 6: Once your Chromebook reboots after applying the update to move you to the developer channel, log in as usual. You’ll now have the Google Play Store (beta) app in your apps tray. Step 7: Open the Play Store app, and move through the terms of service, the backup options, and the request to allow Google to gather anonymous location data. Step 8: If you’re okay with everything, select the Agree button. The Play Store will be set up and you will be asked to accept the Google Play terms of service. Select Accept to continue. 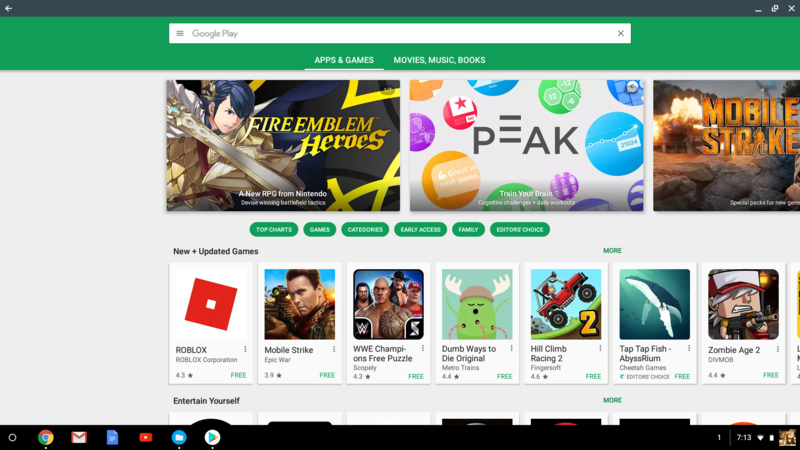 The Play Store will open, and you may be already logged in if your Android account is the same one used to log into your Chromebook. If you’re asked to set up your Play Store account, then follow the instructions. The process of installing Android apps from the Play Store on a Chromebook is similar to doing so on an Android device. You’ll find that the Play Store will be formatted as on an Android tablet. Other Android apps will work the same way — an app will take on the tablet user interface if the developer enabled it. Otherwise, they’ll scale to the Chromebook’s larger screen. Step 1: To install an app, just locate it in the Play Store, select click on its entry, and select the Install button. Step 2: The app will start installing and will pause to ask about any required authorizations. Accept them if requested. 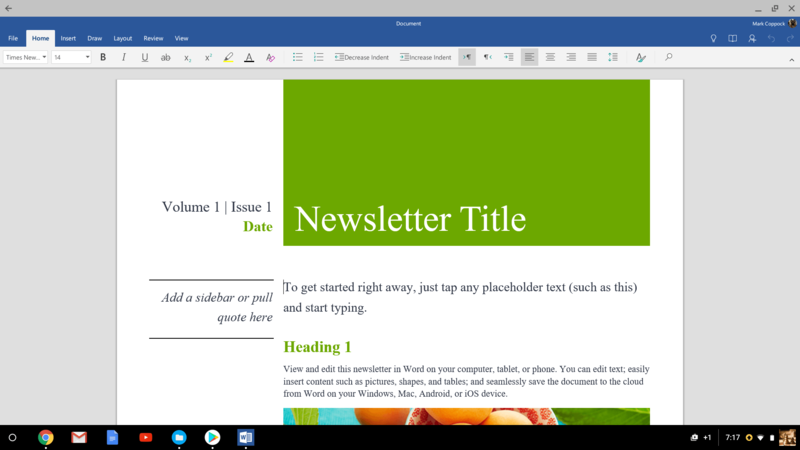 Once the app is installed, it will show up in your Chrome OS apps tray. Select its icon to run it. 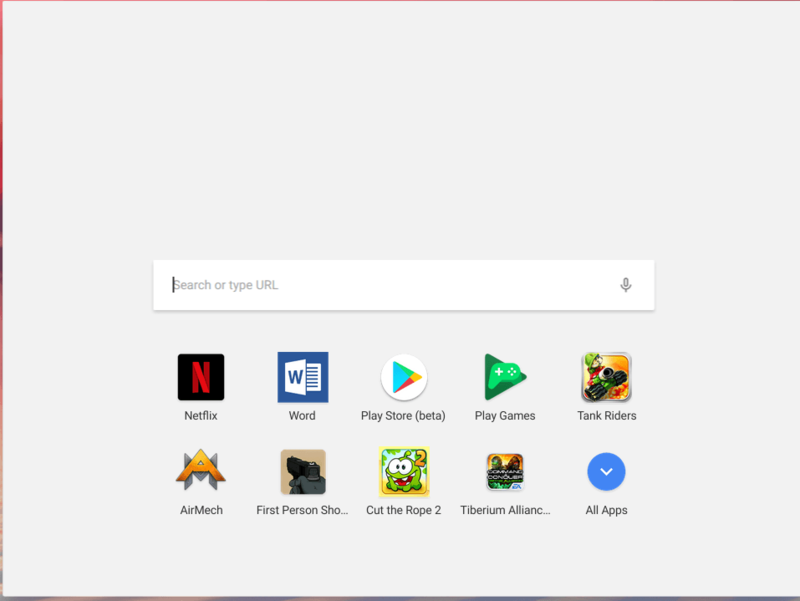 You can manage Android apps like other Chrome OS apps, with the same window controls in the upper right-hand corner and the arrow key in the upper left-hand corner to allow you to navigate through the app. Note: Some apps may be “instant apps,” which means you can open and try them out before downloading them. This is a great way to test out how an Android app functions before you choose to install it or not. Chromebook age: The quality of your Android app experience will vary based on your Chromebook. For example, Chromebooks with touchscreens, and particularly 2-in-1s, will provide the best Android app experience. System components like accelerometers will make playing games and other tasks more enjoyable as well. Remember, always update your Chromebook before trying to download Android apps! Syncing: Your Android apps, like other apps, will try to automatically sync to the data in any other Chromebooks you are signed into. However, they may not sync if you are using the app on a non-Chrome device. Permissions: Your Android apps have permissions settings, too, so you can adjust what data the app has access to on your Chromebook to better protect your privacy. In the Google Play Store, you can select Manage Android preferences and look for the Apps option to adjust permissions for specific apps and learn more. 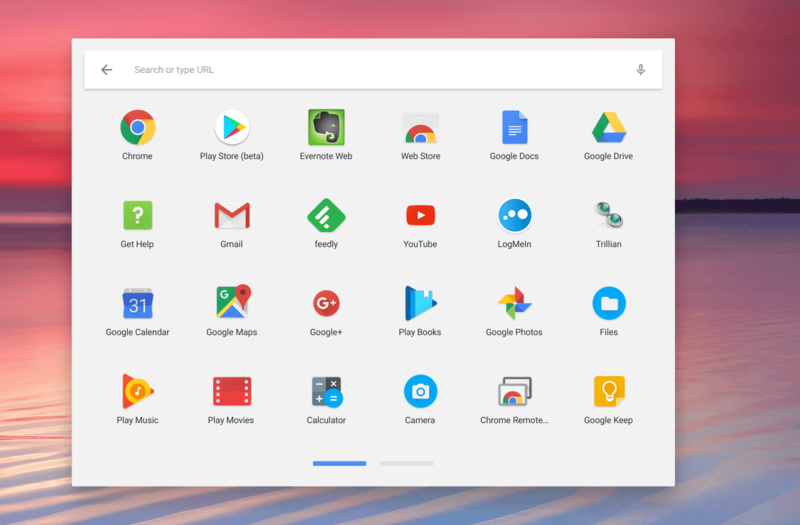 Administrators: Administrator settings may block the ability to add the Chrome Store or Android Apps to your computer. If you’re at work or school, you may want need to secure permissions or move to a different network.